These are lyrics by Gary Allan that we think are kind of nonsensical. 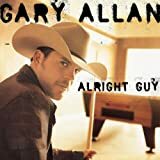 Gary Allan's, "Nothing On But The Radio"
Love the song, but if the lights are low, they're TECHNICALLY still on. So there's a fallacy in saying "nothing on but the radio"